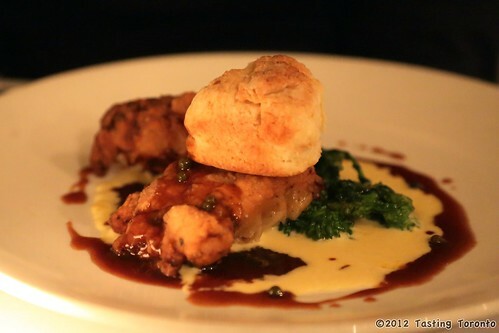 Last night we checked out Trevor Kitchen and Bar. Situated along a strip of restaurants on Wellington beside the iconic flatiron building, with its basement location, Trevor might be easy to miss. One could easily walk past it not knowing that it's a worthwhile destination for a foie gras rich meal or a romantic evening. Trevor offers free corkage with a limit of two 750 ml bottles per table on Tuesdays and Wednesdays. We were tempted to bring a bottle to try it out, though not knowing what food we were going to pair it with, we opted to just have a glass of Stoneburn 2010 Sauvignon Blanc, and a glass of Domaine Brusset 2010 "laurent b." côtes du rhône. 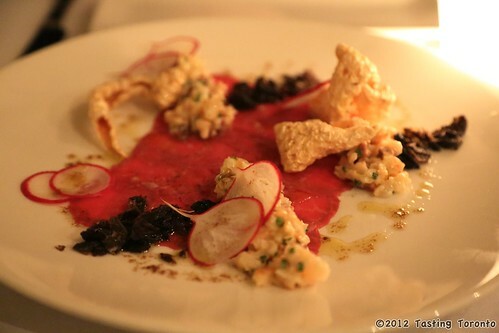 We started off with a Kobe Carpaccio – with shrimp and bacon salad, pork crackling and dried black olives; and a Macaroni and Asiago cheese with seared foie gras. There’s a separate section on the menu dedicated to foie gras appetizers. There’s even an option to add seared foie gras to an entrée for $15. The Carpaccio was thinly sliced and had a nice hint of olive oil. The mild sweetness and cool taste of the shrimp and bacon salad contrasted deliciously with the salty crunch of the dried olives. The pork crackling added another level of texture and made the dish look more interesting, though as a Filipino well acquainted with Chicharon, it felt lacking in seasoning. 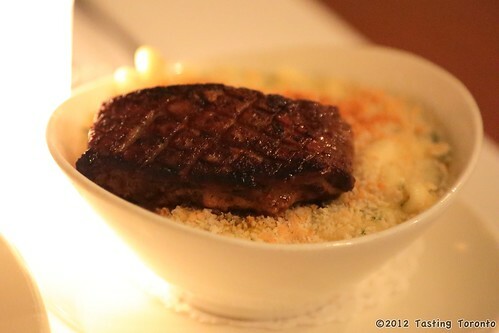 The mac & cheese with foie gras was out of this world! The rich creaminess of the macaroni with a golden cheesy crust alone would’ve been wonderful, but add to that a decadent hunk of seared foie gras that partially dissolved and mixed into the macaroni once you’ve started eating it, plus a swig of red wine, and you can just feel all the pleasure centres in your brain light up. For mains we had the Buttermilk Fried Chicken with creamed corn & rapini in honey bourbon dressing and the Venison Rib Chop with red cabbage, spring vegetables & cloudberry jus. The fried chicken tasted good with the creamed corn dressing with the sweetness of the honey bourbon, though I found the batter a tad salty. 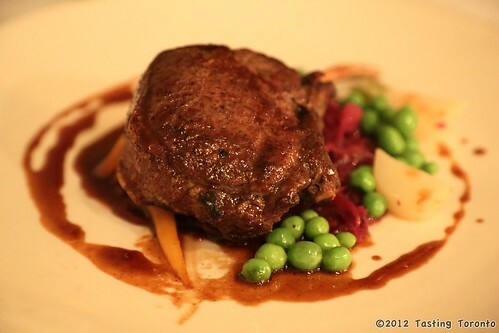 The venison was mildly gamey and a welcome change from eating beef, though the chef-recommended medium rare kind of looked medium if not medium well, with not much pink to find. That was a fairly substantial piece of red meat. Another standout however was our chosen side: Truffled Goat Cheese Poutine! Not even a foot away from your nose and you are already fully immersed in the deep earthy aroma of truffles. That olfactory treat was then followed by the rich salty tang of goat cheese, making for one of the best side dishes out there. Incidentally, the last time I was at this address, a long long time ago, the space was occupied by Bouchon, one of the only places save for Mr. Tasty Fries and Harvey’s where you could get a Poutine in Toronto. 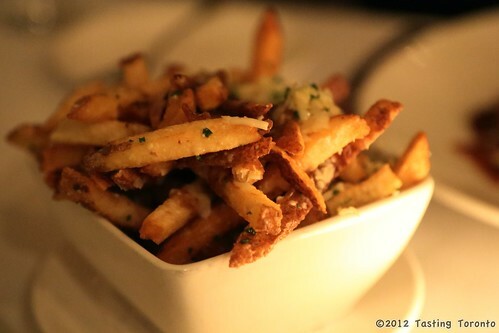 Bouchon served up what was pretty exotic back then… Poutine with foie gras! 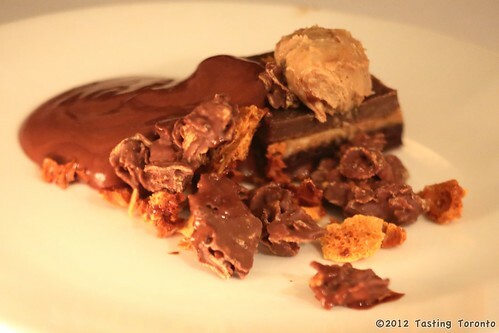 Dessert was Chocolate & Peanut butter fondant with warm chocolate mousse & chocolate textures. Mmmm… peanut butter + chocolate, lots of chocolate. The textures, though they may not be, tasted like an assortment of chocolate-covered corn flakes and bits or coffee crisp. Sweet, crunchy and yummy. Overall Trevor was good, with a slight dip in the mains. The apps and sides were unique and very tasty. The service was friendly and attentive.